Every August brings with it back-to-school, which can be a frenzied time for both parents and kids. For parents, it's a time of getting everyone outfitted with clothes, shoes, school supplies, lunches and altering work schedules to fit in pick-ups, and drop-offs. For kids, it's all about getting used to a new schedule, making friends and making sure you don't miss the bus. In all this activity there can be a tendency to forget about safety and security. In these uncertain times we are living, nothing is more important than keeping everyone safe and sound. This guide will help you to remember all those little things, which can make a difference to your peace of mind. When selecting your child's backpack, make sure it has ample straps, fits comfortably and when filled it does not exceed fifteen percent of your child's body weight. Also remember to put heavier items close to their back, to alleviate strain. Distribute items evenly and use pockets if the backpack has them. Remove any drawstrings from pants, shirts, and sweatshirts to avoid getting them caught on something and possibly choking. Pack art supplies in a tight container or bag and make sure they always conform to the "ASTM D-4236" safety law. When dropping off or picking up your child from school, be mindful that you are responsible for not only their safety but also that of other children on the school property. Drive slowly and observe all speed limits, and watch for stop or crossing signs. Stay well away from buses dropping off or picking up children. Do not make U-turns or pass other cars while on school property and make sure never to use your cell phone or text while driving. You need all your attention on the kids, faculty and other vehicles. Your newly licensed driver may be excited to start driving themselves and friends to school, but it's up to the parent to set the rules to keep everyone safe. First, set clear expectations about safe driving and curfews. Make sure your teen understands the danger of distracted driving, especially texting or using the phone while driving. Limit the number of kids they can take to or from school. The more young teenagers in the car, the more likely things can get distracting. Be sure all kids in the car wear their seatbelts all the time. Study and talk with your teen about the school's driving rules and parking permits. It is a good idea to do a few dry runs with teens in the car to make sure they know the routine and how to safely navigate their way to and from school. Always have them lock the car before going in the school. 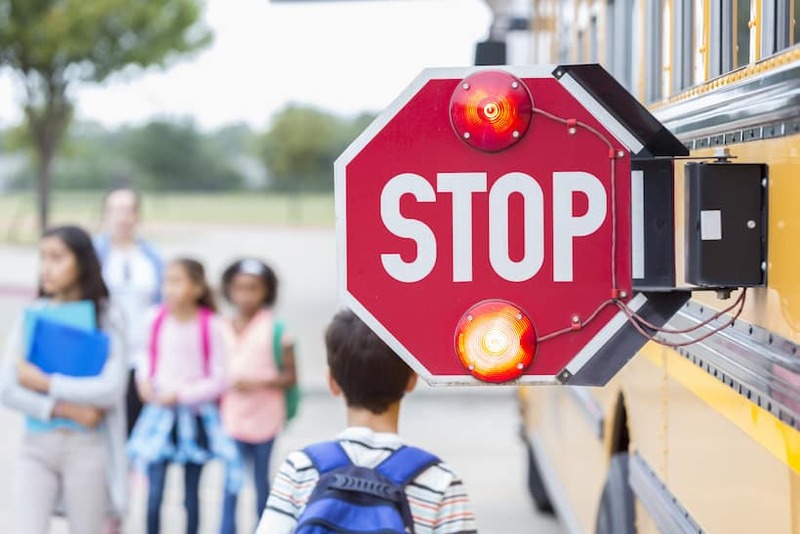 Having your kids take the bus can make life a lot easier, but you should plan on going over some rules for safety with your kids before they start riding to school alone. Wait with your kids or make sure they know where to safely stand while waiting for the bus, so they are not in any danger of other traffic. Instruct your children to never stand up on the bus until it comes to a full stop. There are no seatbelts on buses. Have strict rules about fooling around or fighting while on the bus. It's a good idea to have a rule about not eating and drinking on the bus. Make sure your children know that the bus driver is in charge and to respect their rules at all times. Instruct your kids to take the same route every day, no shortcuts. Tell them not to stop to talk with anyone, especially strangers in a vehicle. Ideally, you would have your kids walk or bike together in groups, never alone and always wear a helmet. Teach your kids the rules of the road for biking. Have a safe house in the neighborhood where kids can go if they feel uncomfortable or observe someone they don't know in the area. Make sure your children understand the dangers and remember to stay alert, be watchful and careful on their way to and from school. If you cannot be home when your kids arrive after school, there are a few things you can do to keep them safe. Install an alarm system with remote alerts and keyless entry, so your child doesn't need to carry a key. Teach them how to use the system and arm it to stay safe. Tell kids never to open the door for anyone they do not know. If the house looks like someone is inside, have a safe house in the neighborhood where your kids can go until help arrives. Have your kids memorize their home address, phone numbers, and your cell phone. Know where your kids are at all times. There are even apps for tracking children's cell phones. You cannot be too careful. Follow these guidelines to keep everyone in your family safe and secure.